Microsoft Outlook 2016 doesn’t provide an easy way to export all of your Contacts to vCard files at once. Fortunately there is a little trick I’ve learned that will accomplish this task. Create an email message in Outlook. Select “Attach Item” > “Business Card” > “Other Business Cards…“. Hold down “Shift” or “CTRL” and click the contacts you wish to include in the export. Click “OK” when finished. Create a folder on your Desktop to hold your vCard files. In the “Attached” section of the fake email you created, you will have a bunch of files with an extension of VCF. You can highlight all of these files and drag them to the folder on your Desktop. 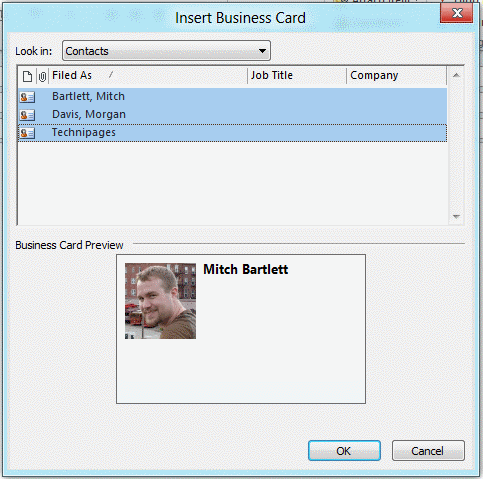 You will now have a folder filled with your previous contacts in VCF or vCard format. Alternately you can email them to yourself if you wish to move them to another computer. Neat trick isn’t it? Maybe some day Microsoft will include an easier way to do this. I did what Jelisse said! If you select more than just a few contacts, Outlook crashes. It does this consistently. It does this even if you uninstall Office and re-install Office. I got as far as having a file on the desktop with the vcards but could not see how to import them into webmail. Used the contacts/import and found the card with the vcards but then nothing happened. What do you do next? I have discovered a quick and easy way to backup Outlook contacts. Select all, copy and paste into word document. To re-install, double click the contacts and it will open into Outlook again.